My child's allergic to dust mites - what you need to know in case yours is too! I recently discovered that one of my sons is allergic to dust mites, not great news when I loathe vacuuming. Think your child might be too? Here’s everything you need to know about the allergy and how to ease those pesky symptoms. My middle son is quite prone to allergies. When he was really little he had a bit of eczema and egg gave him a rash. As he got older, we realised he suffers from hay fever (often sneezing on the soccer field, in the garden and near our cat) and last year had a case of viral asthma. Earlier this year, though, the sneezes, coughs and itchy eyes got worse than ever and so off to the specialist we went. Fearing he might be allergic to our beloved cat, a prick test soon revealed he was, in fact, allergic to house dust mites instead. They’re microscopic little buggers less than half a millimetre long that are wingless, oval-shaped and light coloured with faint stripes – although because they’re so small they’re not visible to the naked eye. Unlike other pests, like fleas, they don’t bite, but they do feed off our dead skin (among other things like mould), which means they hang out wherever there’s lots of our discarded skin particles and dust – hence their name. In particular, they love warm, dark and humid environments with favourite hiding spots being mattresses, linen, pillows, furniture, carpet and soft toys. It’s estimated that one-third of your pillow’s weight is actually living and dead dust mites and their droppings. Nice. Like other allergies, certain times of the year are worse than others for dust mite allergy sufferers. For example, summer is quite bad due to the hot and humid temperatures (which dust mites love), plus the use of fans and air-conditioning can stir up all the dust, making the dust mites airborne. Additionally, winter can also increase allergy symptoms due to excessive use of heaters and extra blankets and linen that may have been stored away for a while. 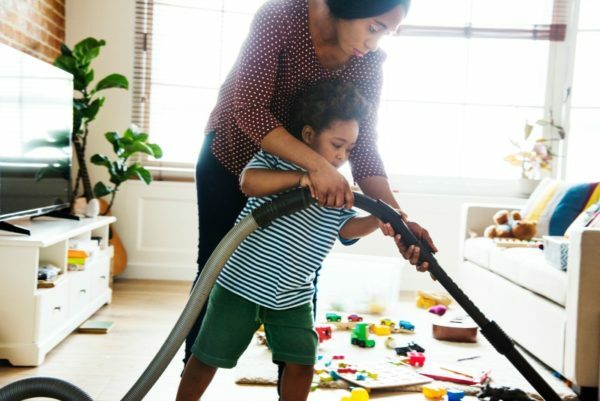 On the other hand though, spring and autumn can be refreshingly good for dust mites because you can usually leave the windows open to let fresh air in and the dust out. When my son got the dust mite allergy diagnosis, naturally I panicked. Was I going to have to vacuum and dust rigorously on a daily basis? Ain’t nobody got time for that! I was told by the doctor that if symptoms were really bad we could investigate allergen immunotherapy – which is where they deliberately expose you to dust mites to help build up immunity to them. However, this is apparently quite a lengthy and costly process. Therefore the best options he advised were over-the-counter nasal sprays and oral medications (whenever symptoms flared up), plus other basic methods to help reduce the number of dust mites in our home (living and dead). I must say, my son’s dust mite allergy is quite under control at the moment with no more tears from sore, itchy eyes and a lot less coughing and sneezing. However, to say I’m looking forward to spring is an understatement. Bring on the fresh air! Although let’s just hope his hay fever stays at bay ..! If you suspect your child might be allergic to dust mites or something else, please speak to your doctor for an assessment.